Cyril was born August 15, 1885 in the now abandoned community of British Harbour to Arthur and Mary (Colbourne) Gardner. After finishing school Cyril probably worked with his father's businesses in British Harbour and Trinity. When he enlisted at Trinity on December 22, 1914, his occupation was given as accountant. He was approved fit for foreign service by Dr. Cluny Macpherson on December 26, 1914 and was assigned Regimental Number 824.. He embarked with the second draft on the troopship Dominion on February 5, 1915. He served at Gallipoli, was promoted to Lance Corporal November 14, 1915 and to Corporal February 27, 1916. He was wounded at Beaumont Hamel on July 1, 1916 but was able to rejoin the unit on August 7, 1916 and was promoted to Sergeant August 24, 1916. One month later, on November 11, 1916 Cyril was promoted to Company Sergeant Major. "On January 27, 1917 (German Kaiser Wilhelm's birthday), the Newfoundlanders had provided a blanket of trench mortar fire to assist the 1st Border Regiment and the Inniskilling Fusiliers advance towards their objective. The objectives were quickly achieved and "C" Company of the Newfoundland Regiment was detailed to carry supplies forward and bring in the wounded for the Border and Inniskilling Regiments. Company Sergeant Major (CSM) Cyril Gardner, #824, led a party of stretcher bearers to pick up the wounded of the Border Regiment. He sent the stretcher bearers ahead and continued to search for other wounded soldiers when he saw a German officer looking over the parapet of a trench. The Border and the Inniskilling Regiments had advanced so quickly they missed the trench that was occupied by a large number of German soldiers. The German officer, realizing he was now behind British lines and that it would be futile to put up any resistance, climbed out of the trench and approached CSM Gardner. Unarmed at the time, Gardner relieved the officer of his sidearm and said, "You are late. Everybody else has kamaraded (surrendered)." The officer returned to his trench and spoke to his soldiers. Seventy two German soldiers then left the trench and surrendered to Gardner who marched them back to his lines and handed them over to a speechless sergeant of the Border Regiment. The event was not without incident. The story is that while he was escorting his prisoners back to the prisoner of war cages he came upon a British officer. Not noticing Gardner following up the rear of the column of prisoners, the British officer automatically raised his rifle, released the safety lever, and took aim. Before he was able to squeeze the trigger, Gardner quickly intervened and prevented the officer from firing. Once the situation had been diffused, a grateful senior German office removed his Iron Cross 1st Class, a German gallantry award, from his uniform and presented it to Gardner. 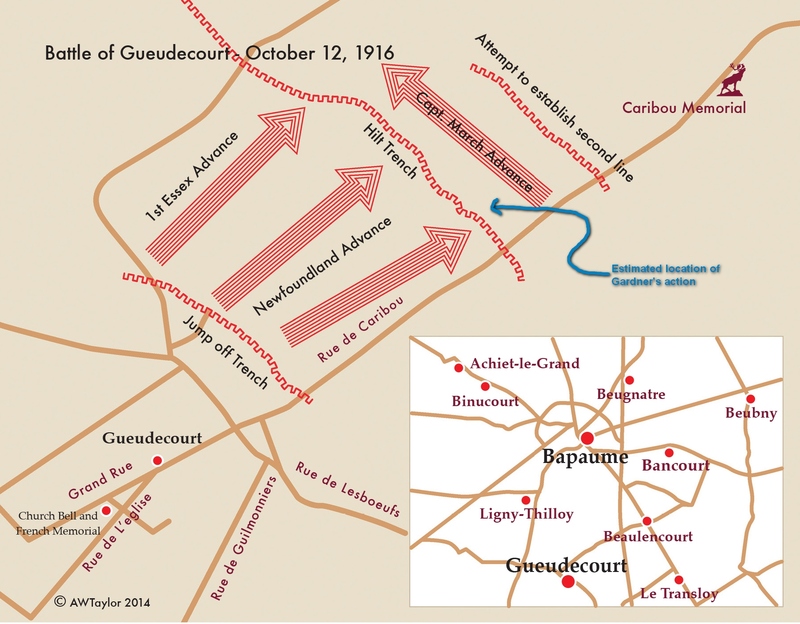 For his efforts, CSM Cyril Gardner was awarded a Bar to the Distinguished Conduct Medal previously earned at Gueudecourt on October 12, 1916." Two of Cyril's second cousins were members of the Regiment and returned home after the war. In all probability, they would have discussed this event with Cyril. The story around British Harbour in the forties was that the British officer actually shot some of the prisoners. Cyril's niece, who now lives in Ottawa, has said that her father, Cyril's brother, was a good friend of Tommy Ricketts, V.C., and they often had discussions and Ricketts remembered Cyril's exploits with admiration. Cyril was promoted to Second Lieutenant on February 17, 1917 and unfortunately died shortly after on April 14, 1917 at Monchy-le-Preux, France. His name, along with that of his younger brother L/Cpl Edward James Gardner (Ned), who died at Beaumont Hamel, is on the Memorial to the Missing Plaques at Beaumont Hamel and now also at Bowring Park, St. John's. Cyril's medals, including the Iron Cross are now in the possession of his brother's family in Ontario. It might be of interest to note that Ancestors in the Attic did a show called The Legend of Cyril Gardner in January, 2010. A DVD with that show is available in the Regimental Museum. We should also note that Cyril's sister, Grace, who was a Registered Nurse also served in WWI. She was associated with Queen Alexandra's Imperial Military Nursing Service (QAINS), and saw duty with the Mediterranean Expeditionary Forces serving in Egypt, Sahara and Jerusalem and was eventually invalided to England after several attacks of malaria. She passed away in April, 1937 at the General Hospital where she had trained as a nurse. Their father, Arthur, passed away in May 1918. Many say that he died of a broken heart, never having recovered from the loss of his sons.